An entirely new research experience. 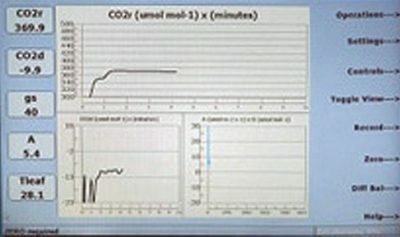 Generate ultra-fast A/Ci curves in a fraction of the time using our innovative and programmable high-speed CO2 ramping technique. Our system is easy to use and highly intuitive. That means minimal training is needed, allowing you to begin collecting data shortly after your system arrives. Built-in system help dialogs are there to guide even the most inexperienced user every step of the way. Rely on the defaults or customize your own settings to monitor and display numerical and graphical data. 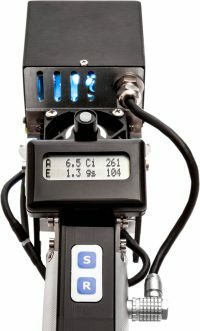 The CIRAS-3 is a true differential analyzer featuring four independent gas analyzers for CO2 and H2O. 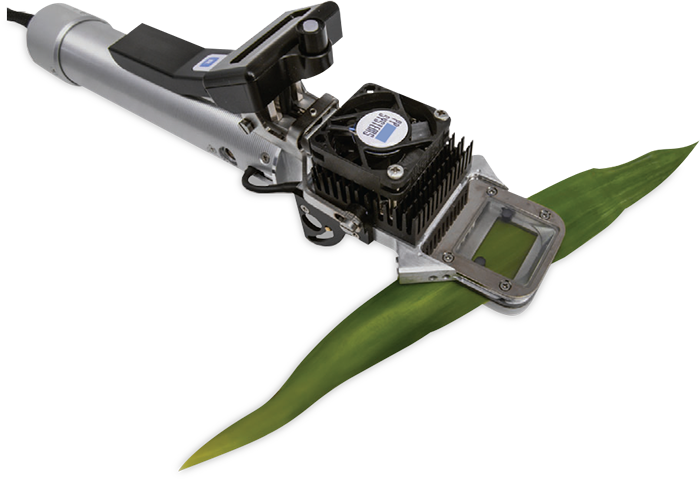 It’s compact size and small total system volume ensures the most rapid, accurate equilibration and leaf gas exchange measurement. The CIRAS-3 offers fully-automatic, complete and independent control of CO2, H2O temperature and light for response curves (i.e. fast A/Ci curves, light response, etc.) Control of all environmental parameters can be dynamic or preprogrammed. The CIRAS-3’s temperature stability and control is the most reliable in the industry. We also offer one of the widest temperature control ranges available with an extensive variety of different controlling options. Our CFM-3 Chlorophyll Fluorescence Module has a built-in light source. 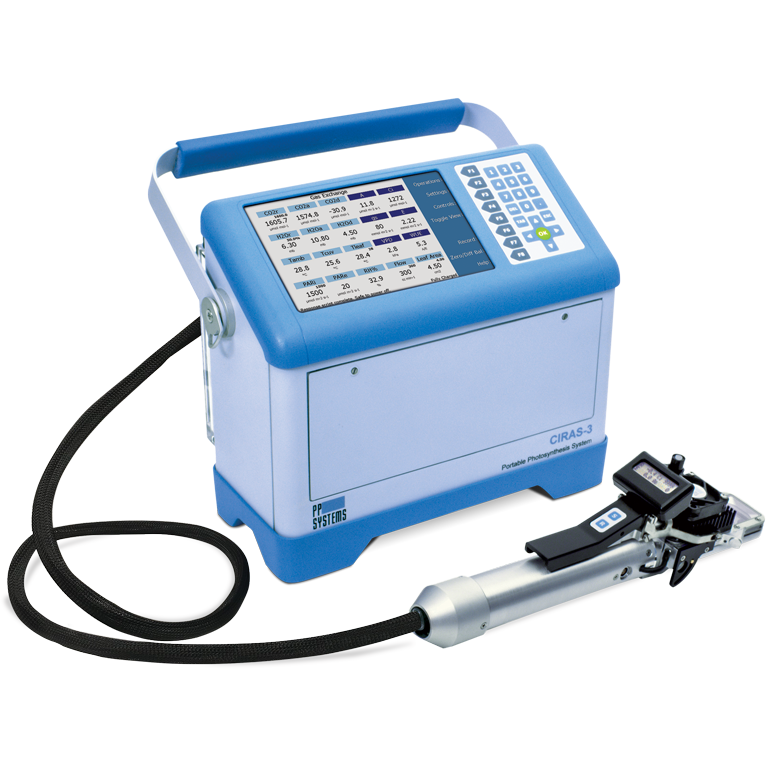 It can be used as both a fluorometer (PAM) and as an independent light source making it not only versatile but time and cost-efficient. Our unique “Multi-Pulse™ technology allows for the popular estimation of apparent Fm’. The CIRAS-3 is designed with the high-level field researcher in mind. Its small size makes it the most mobile photosynthesis system of its kind, alleviating the need for assistance or tripods. 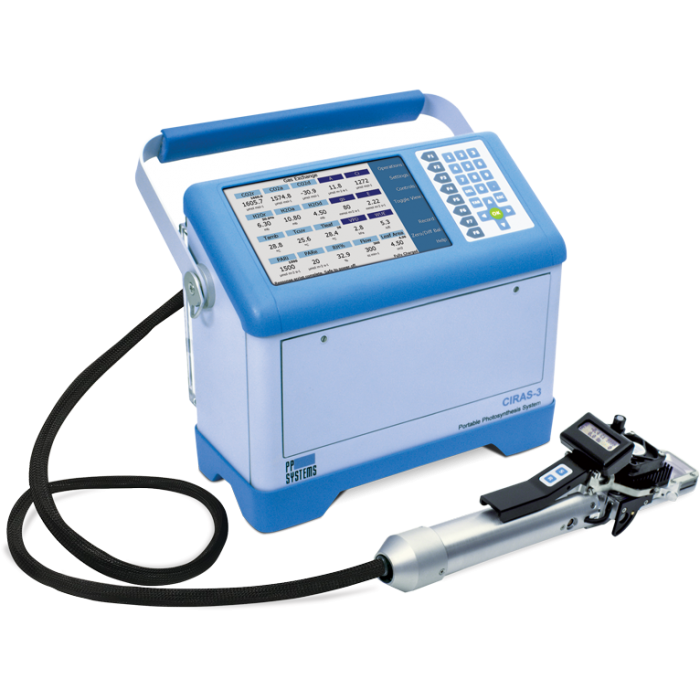 The innovative design of the CIRAS-3 utilises its small system volume to ensure faster equilibration as well as the most rapid and accurate measurements available. Faster measurements allow the user to expand the parameters of their research and use their time and resources efficiently. Check out the size and weight of the CIRAS-3 console and leaf cuvettes and you will quickly discover why smaller and lighter is better. The location of the CIRAS-3’s IRGAs (Infrared Gas Analysers) in the main console — right next to the internal gas mixing system and flow control — allows the CIRAS-3 to provide an ultra-fast response to changes in “reference” gas, and the fastest and most accurate mobile photosynthesis measurement available. 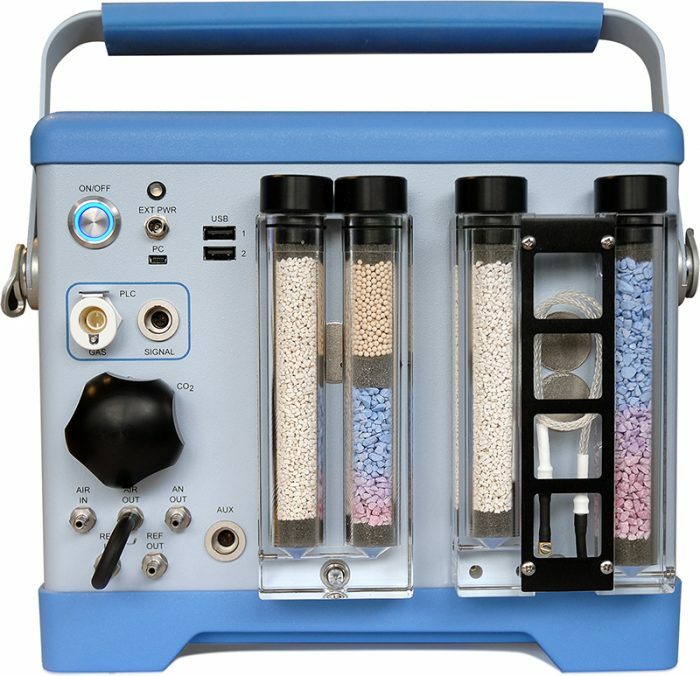 IRGAs in the console makes the entire system highly portable, not to mention the added protection from dirt, dust, and debris commonly found in and around a leaf cuvette. Sound system electronics coupled with powerful Li-ion battery packs allows operation of the CIRAS-3 system for up to 12 hours. An important element of field work, you will find our batteries allow for a much longer duration of time in the field as well as eliminating the need to swap out batteries. For many years researchers have been regularly performing steady-state A/Ci curves on a wide variety of vegetation providing very useful information on plant status. PP Systems is excited to announce that the CIRAS-3 is capable of performing rapid A/Ci curves in just a fraction of the time it takes to perform steady-state measurements based on our innovative High-Speed CO2 Ramping Technique. 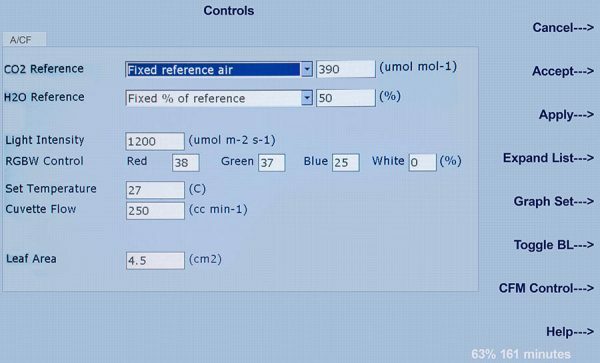 It is possible to generate A/Ci curves in less than 5 minutes with the CIRAS-3! However, the actual length of time to perform these measurements is highly dependent on user settings and parameters of interest. What is the purpose of rapid A/Ci measurements? Whether the third parameter can be quantified with this method depends on the metabolic properties of the leaf. 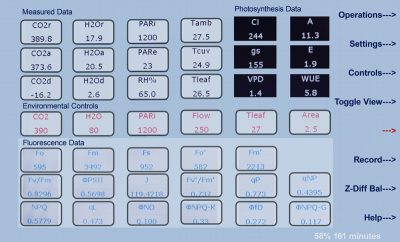 The above three parameters, which are all temperature dependent, combined with stomatal conductance values, permit estimation of leaf photosynthesis under any combination of light, temperature, CO2, and humidity via the Farquhar, von Caemmerer and Berry photosynthesis model. One could obtain the same two or three parameters by doing slower, steady-state measurements of A at a range of Ci values, but that is quite time-consuming (generally at least 30 minutes, but sometimes up to one hour, as compared with possibly as little as 5 minutes per leaf with our rapid A vs. Ci method). How does the CIRAS-3 measure rapid A/Ci? The CIRAS-3 features a highly accurate, true differential gas analysis system for both CO2 and H2O. 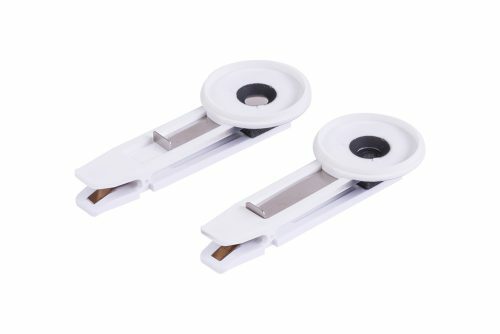 It can easily, quickly and accurately linearly ramp the CO2 concentration in the leaf cuvette in order to produce a complete A vs. Ci curve in just minutes. Our unique stored differential balance feature allows simplified data recordings and straight-forward post-processing in Excel. Our response script editor allows users to easily generate and edit linear response scripts to meet their specific requirements. 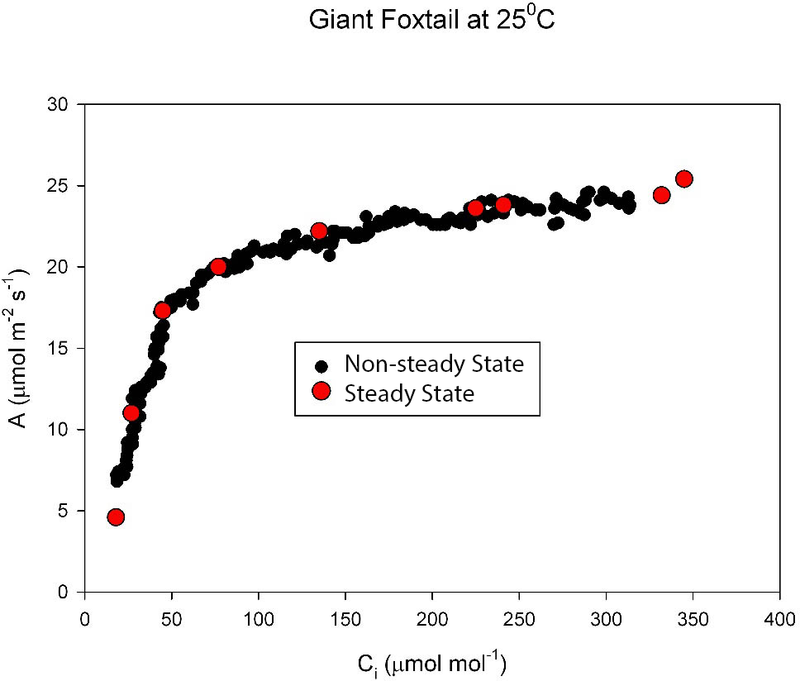 Comparison of a Non-Steady State High-Speed A/Ci Ramping (black points) to traditional point-by-point Steady State (red points) for a typical C4 Giant Foxtail leaf with PAR of 1500 µmol m-2 s-1 and Cuvette Flow of 300 ml/min. Reference CO2 ramped from 50 to 500 in 7 minutes. Each Steady State point had an approximate 2 minute acclimation time for total data recording time of 18 minutes. Comparison of a Non-Steady State High-Speed A/Ci Ramping (black points) to traditional point-by-point Steady State (red points) for a typical C3 Soybean leaf with PAR of 1500 µmol m-2 s-1 and Cuvette Flow of 300 ml/min. Reference CO2 ramped from 100 to 1000 in 10 minutes. 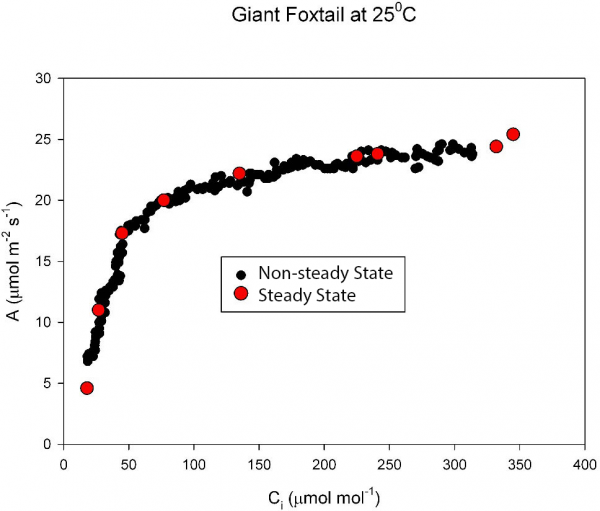 Each Steady State point had an approximate 2 minute acclimation time for total data recording time of 22 minutes. 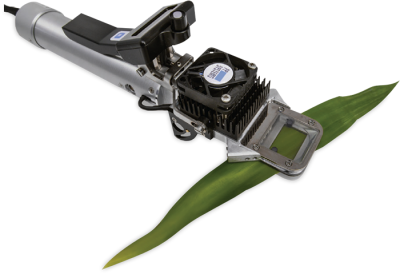 The heart and soul of any photosynthesis system is the analyser. Accurate, reliable and stable measurement and control of CO2 and H2O are critical for high-level research. The CIRAS-3 is a “true differential analyser” featuring 4 independent, non-dispersive gas analysers for accurate, simultaneous measurement and control of both CO2 and H2O. This is a significant advantage over “gas switching” systems and a major requirement for most researchers. For enhanced reliability, there are no moving parts such as chopper motors or filter wheels. The gas analysers include an infrared source, highly polished, gold plated sample cells and detectors that are optimised for CO2 (4.26 µm) and H2O (2.60 µm). The analysers act as absorptiometers measuring infrared absorption only. The optical bench is temperature controlled and pressure compensated ensuring the most accurate measurement of CO2 and H2O under changing ambient conditions. 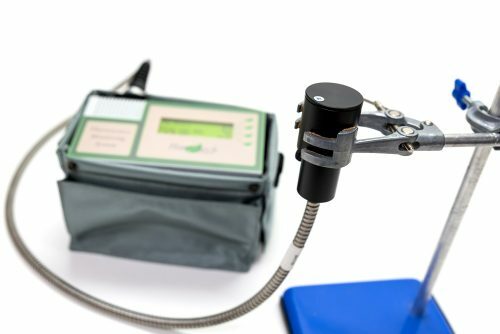 The design of the CIRAS-3 ensures an inherent calibration stability that has been confirmed by over 35 years of experience in gas analysis technology. The CIRAS-3 features an innovative Auto-Zero function that allows for fast warm-up, adaptation to changing ambient conditions and excellent stability. In short, expect accurate, reliable and stable calibration for many years without the need for time-consuming, expensive recalibration. The Auto-Zero function minimises effects on span (gas sensitivity) of sample, source aging, changes in detector sensitivity and changes in pre-amplifier gain. Periodic system checks are simple and recommended to confirm system integrity and calibration. 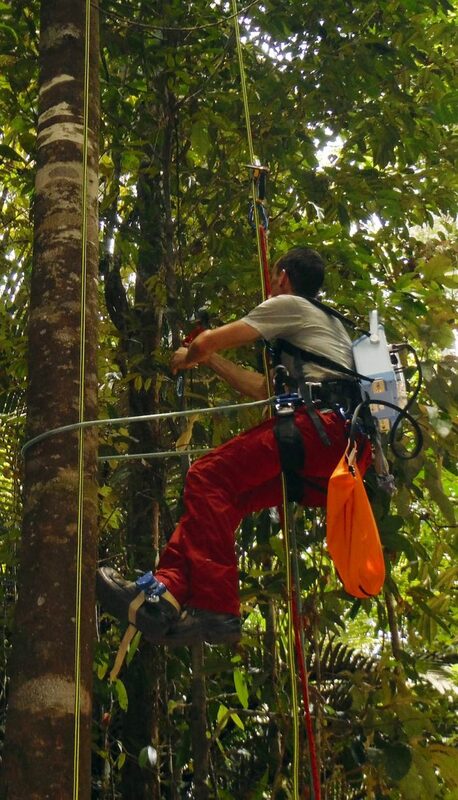 The level of environmental control in the field with the CIRAS-3 is unsurpassed. 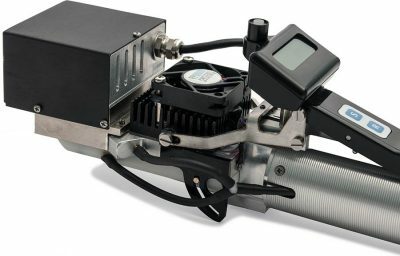 The CIRAS-3 offers complete, independent and automatic control of CO2, H2O, temperature, and light for response curves (i.e. A/Ci curves, light response, etc.) with fast time response. 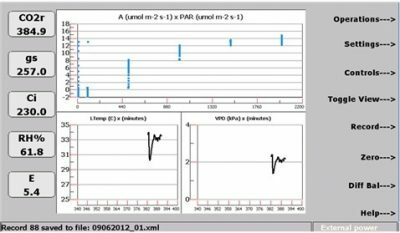 Control over all environmental parameters can be dynamic or pre-programmed for automated response curve generation. All power required for environmental control is provided by the internal rechargeable Li-ion batteries (no external power supply is required). Unlike some systems, automatic CO2 control is standard with the CIRAS-3. Our innovative, integral gas blender and regulator mixes pure CO2 provided by mini CO2 cartridges (8 g) with CO2 free air to provide a very accurate, stable, continuous and constant flow of CO2. Each CO2 cartridge is capable of providing up to a minimum of 12 hours continuous use. It is very easy to change out cartridges and there is little to no maintenance required for the CO2 gas blender or regulator. On-board, self-indicating desiccants are used for conditioning the H2O concentrations per user-selected intervals. Measurements above ambient are also easily achieved. Automatic, accurate and stable temperature control is standard and integral with all leaf cuvettes. 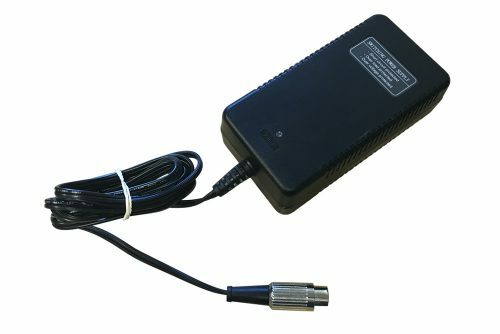 Peltier elements are mounted to the head along with heatsink and fans for precise control of temperature over a wide range. The user has the ability to disable temperature control, track ambient or to control at a set temperature. CIRAS-3 back panel featuring CO2 cartridge holder, gas and electrical connections and desiccants for instrument zero and CO2/H2O control. Automatically control both light intensity and proportion of light by wavelength. All leaf cuvettes can be supplied with an optional, compact LED light unit for automatic control of light. Each light unit features a bank of red, green, blue and white LEDs (RGBW) allowing for control of both light intensity and proportion of light by wavelength. Our PLC3 leaf cuvettes work seamlessly with the CIRAS-3. The innovative design makes for fast and efficient measurements just about anywhere! No need for assistance or a tripod! Their small size and fast response further enhance the CIRAS-3’s capabilities. The CIRAS-3 supports three standard leaf cuvettes (Universal, Narrow, and Conifer) which are truly plug & play. Each cuvette connects directly to the CIRAS-3. 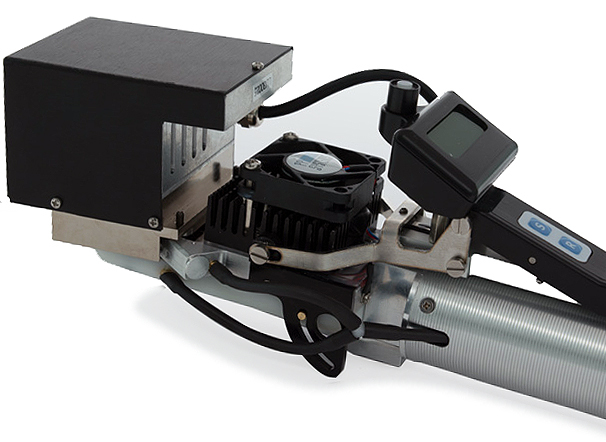 No time-consuming, delicate reassembly or adjustment of different heads and sensors. 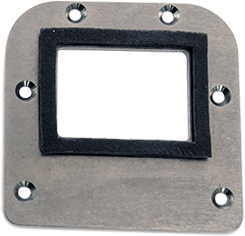 The leaf cuvette gaskets provide an air-tight seal without causing any damage to vegetation. Automatic temperature control is standard with all leaf cuvettes. 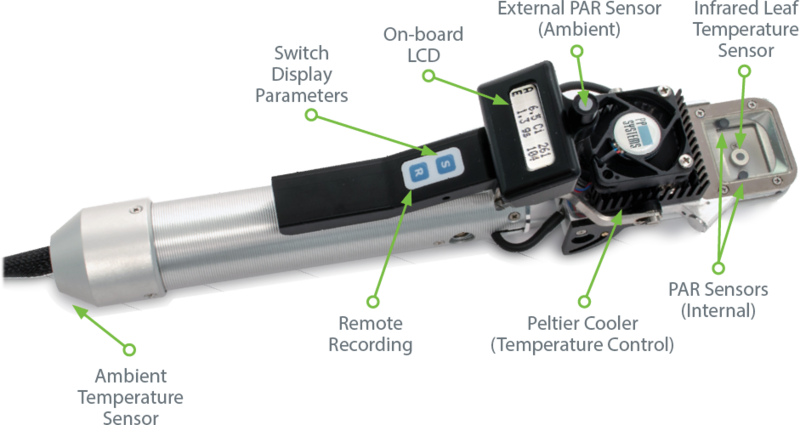 All PLC3 series leaf cuvettes include an onboard LCD allowing the user to display up to 8 user-defined parameters. Measurements can also be recorded remotely from the leaf cuvette for convenience and ease. Our PLC3 Universal Leaf Cuvette is our most popular leaf cuvette by far. The PLC3 Universal is designed for measurement on most flat, broadleaf plants. It features 3 different windows allowing you to customise the head to accommodate different sized leaves. 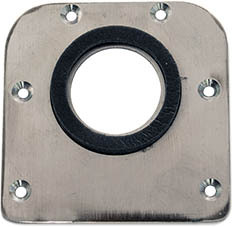 Dimensions: See head plates below. Includes 2 miniature silicon photodiode sensors providing a reliable average of PAR inside the cuvette in addition to ambient PAR measured by an external sensor. 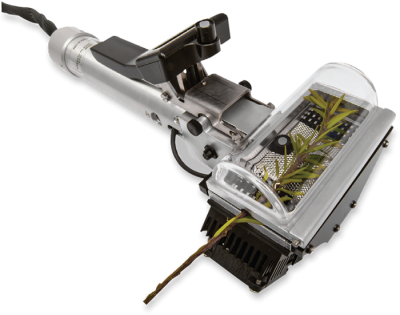 It also includes an infrared (IR) radiation sensor for accurate, non-contact measurement of leaf temperature. 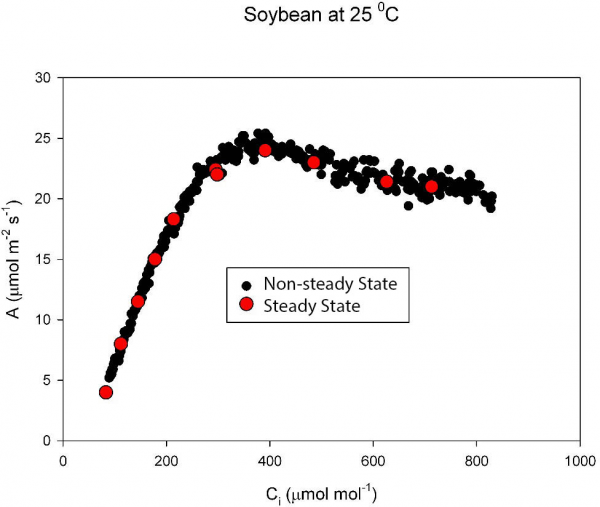 Leaf temperature can also be determined by energy balance. 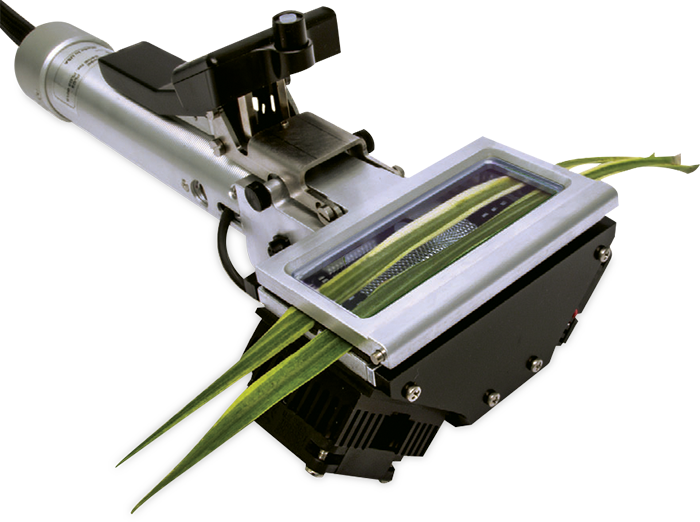 For measurement on grasses, cereal crops and short needle conifers. The window is hemispherical making it suitable for 3D structures. Includes 1 miniature silicon photodiode sensor providing measurement of PAR inside the cuvette in addition to ambient PAR measured by an external sensor. Leaf temperature is calculated based on energy balance or precision thermistor for contact measurement. 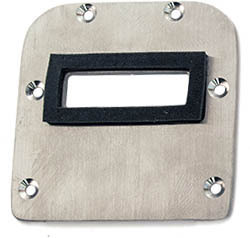 An optional head plate can be supplied to easily convert from “conifer” to “narrow”. For measurement on grasses, cereal crops, and long needle conifers. Includes 1 miniature silicon photodiode sensor providing measurement of PAR inside the cuvette in addition to ambient PAR measured by an external sensor. Leaf temperature is calculated based on energy balance or precision thermistor for contact measurement. An optional head plate can be supplied to easily convert from “narrow” to “conifer”. 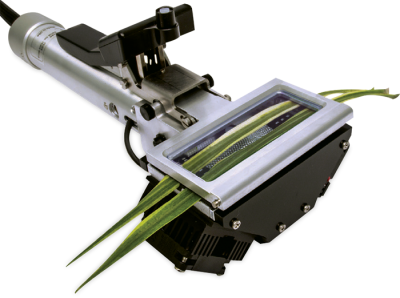 The CFM-3 Chlorophyll Fluorescence Module is capable of both independent measurement of chlorophyll fluorescence as well as simultaneous measurement of photosynthesis and chlorophyll fluorescence. The CFM-3 is compact and elegantly designed with all light sources and fluorescence detection capability built directly into the light unit. 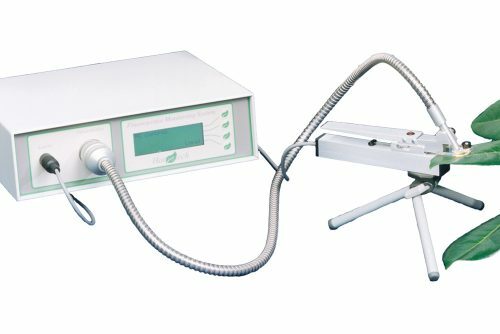 The CFM-3 can be used as an actinic light source for leaf gas exchange and as a pulse-amplitude-modulated (PAM) fluorimeter for measurement of chlorophyll fluorescence on both dark and light adapted vegetation. The CFM-3 is capable of delivering saturating pulses up to 10,000 µmol m-2 s-1 which is extremely useful in accommodating a wider range of ambient light conditions. The CIRAS-3’s Multi-Pulse™ technology produces a sequence of saturating light levels for estimation of apparent Fm‘. 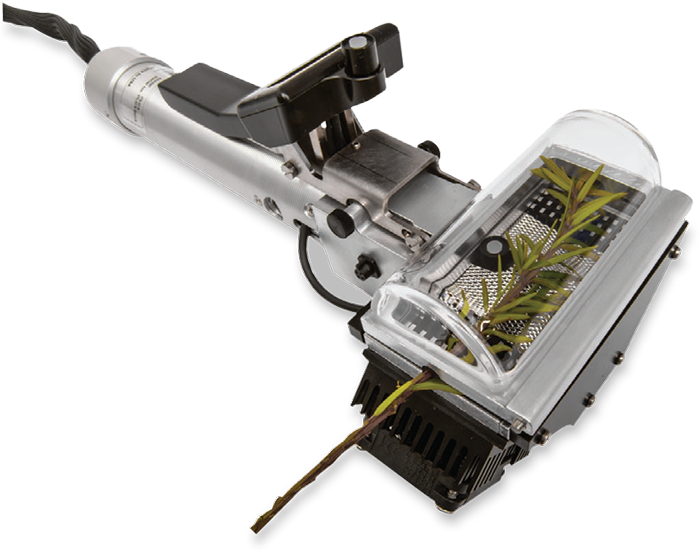 The CFM-3 Chlorophyll Fluorescence Module is an optional accessory designed exclusively for use with the PLC3 Universal Leaf Cuvette. The CIRAS-3 main console incorporates a large, full color 7.0” WSVGA transflective display featuring superb readability under all ambient conditions including full sunshine. The display is custom designed with a 30° viewing angle making it easier to read from different positions ensuring measurements can be performed and recorded by just one person. A custom, tactile-feel keypad is available for all user input. Customise the information that you would like to be presented on the LCD under your system preferences. Many of the displays and presentation of data is user-definable. With just a few key presses manual, automatic and response curves can be created, run and saved to internal memory or to a convenient USB thumb drive (memory stick). Data storage is flexible and unlimited and can easily be transferred to your PC for further analysis in your favourite spreadsheet program. CO2 reference, CO2 analysis, CO2 differential, H2O reference, H2O analysis, H2O differential, air temperature, leaf temperature, cuvette temperature, PAR internal, PAR external, relative humidity, atmospheric pressure, flow, Ci, gs, A, E, VPD and WUE. Programming simple or complex experiments could not be any easier. Users can create their own response curves using the popular XML programming language. Once created, programs can be downloaded to the CIRAS-3 or even shared with other CIRAS-3 users. Programming simple or complex experiments from a PC could not be any easier. Users can create their own response curve scripts using the popular XML programming language. 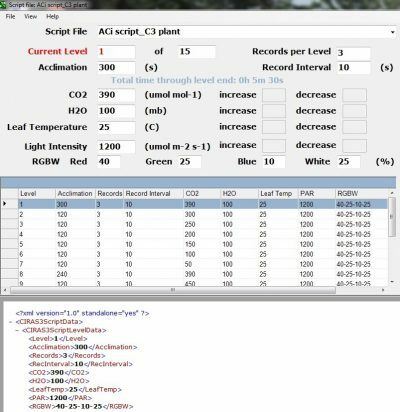 Once created, programs can be downloaded to the CIRAS-3 console or shared with other researchers that might want to replicate measurements.